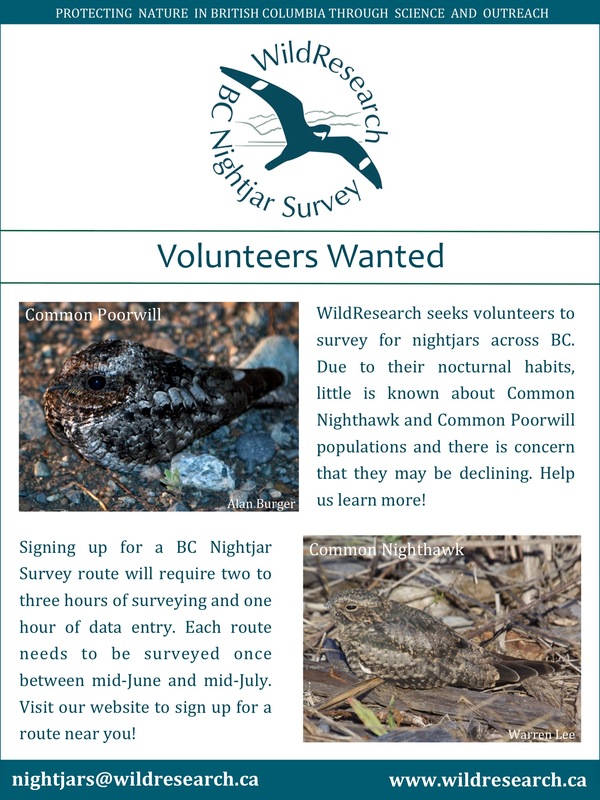 WildResearch <http://wildresearch.ca/> is seeking volunteers for the BC Nightjar Survey, a citizen science program to survey for nightjars in BC. Why? Little is known about Common Nighthawk and Common Poorwill populations BC, and there is concern that they may be declining. Help researchers learn more! Volunteers across BC are needed to survey for nightjars between mid-June and mid-July. Routes require only two to three hours to survey, and one hour of data entry. Routes are a series of roadside stops and need to be surveyed only once per year during the breeding season. Everyone with a vehicle, and good hearing is invited to conduct a BC Nightjar Survey!